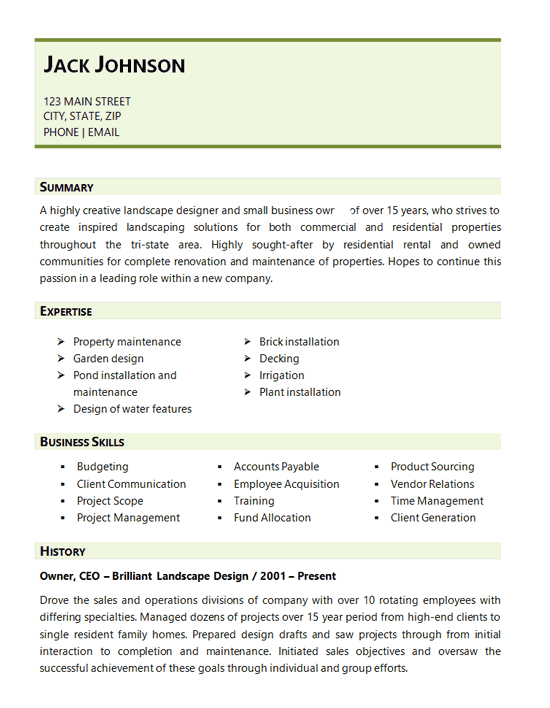 The Landscaping Resume Example is for a hard working professional that is well-known in their region as a highly regarded landscape designer and business owner. As a small business owner, their experience ranges from both their craft of property design and management to the necessary skills for running and growing a business. This resume sought to briefly highlight the candidate’s particular areas of expertise, while preparing their candidacy for a management role within another similar company, where an opportunity had presented itself. Their expansive knowledge gained over 15 years of servicing properties has equipped them in both the craft of landscape design, as well as running a business with multiple employees. A highly creative landscape designer and small business owner of over 15 years, who strives to create inspired landscaping solutions for both commercial and residential properties throughout the tri-state area. Highly sought-after by residential rental and owned communities for complete renovation and maintenance of properties. Hopes to continue this passion in a leading role within a new company. Drove the sales and operations divisions of company with over 10 rotating employees with differing specialties. Managed dozens of projects over 15 year period from high-end clients to single resident family homes. Prepared design drafts and saw projects through from initial interaction to completion and maintenance. Initiated sales objectives and oversaw the successful achievement of these goals through individual and group efforts.